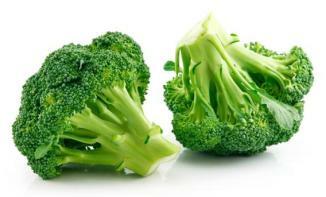 Broccoli is an excellent source of vitamin A, vitamin C, vitamin K, and folate. Folate is a water-soluble vitamin that works with vitamin B12 to form hemoglobin in red blood cells. Folate can lower a woman’s risk of having a child with certain birth defects and is being studied for its ability to help protect against heart disease. California is the number one commercial producer of broccoli in the United States, producing more than 90 percent of the nation’s crop. Broccoli is available year-round in California and grown in four main regions: the south desert valley (Imperial and Riverside counties); the southern coast (Ventura, Santa Barbara, and San Luis Obispo counties); the central coast (Monterey, San Benito, and Santa Cruz counties), and the Central Valley (Fresno, Kern, Stanislaus, and Tulare counties).